The Bonded Warehouse is a looming presence in the middle of the old Granada Studios complex in Manchester city centre: a cavernous reminder of the industrial revolution, soon to be transformed into a hub for the kind of creative enterprise that is now forging the digital revolution. That symbolism was compelling enough for David Cameron and George Osborne, in June 2014, to choose this place to enunciate their vision for a northern powerhouse: connecting the great cities of the north and unleashing regeneration by rebalancing the economy. 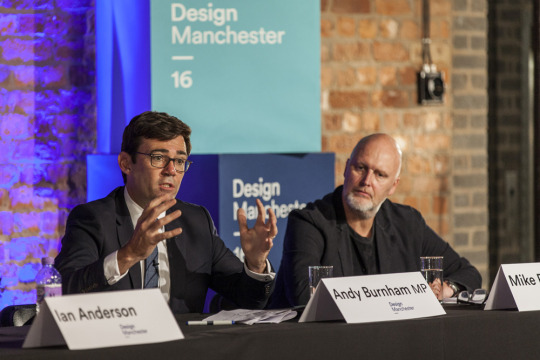 It was in the very same room that Manchester’s design community gathered in October 2016 for Design Manchester’s third annual Great Debate – the Tory posh boys having vacated the stage in a manner not of their choosing, with significant unanswered questions for those left behind to resolve. On one thing most protagonists are agreed. Whatever Brexit and Theresa May’s ‘industrial strategy’ will turn out to mean, city devolution will have an important part to play, not least because that is the only train of the many mooted that has not only been built but actually left the station. In May 2017, there will be metro-Mayoral elections in nine city regions including Greater Manchester, Liverpool, Sheffield and the West Midlands, each with its own devolution agreement. Common ground also, among economists, educators and enterprise, is that if we are to create a successful narrative, the creative and digital industries will be at the heart of it. 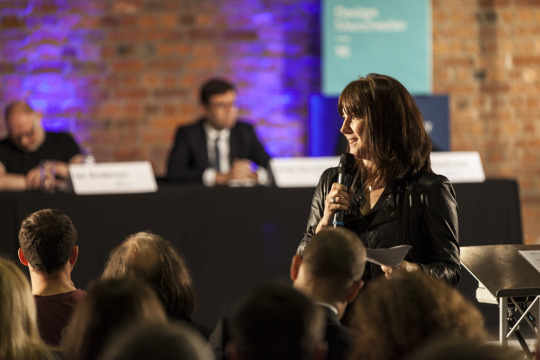 The debate was chaired by Lou Cordwell, Founder and CEO of magneticNorth, member of GM LEP and chair of Design Manchester advisory board. Penny Macbeth is the Dean of Manchester School of Art at Manchester Metropolitan University. Penny’s challenge elicited a commitment from Mayoral candidate Andy Burnham, who feels the university route is overemphasised at the expense of other options. “One thing I will do,” he pledged, “is build a UCAS-style clearing system that covers all the apprenticeships available across Greater Manchester, so that a young person in Oldham or Rochdale or Leigh, who at the moment is struggling to see what’s out there for them, can see apprenticeships somewhere else in the region that they could do.” Andy believes this will bring business, universities and colleges together in focusing on areas that need strengthening. Emer Coleman pointed out that new jobs will largely come from technology and digital – and in this sector there are serious gender inequalities. Her suggestion was that the city should address this by funding the course fees for new software developers. “When people talk about an ‘industrial strategy’,” she said, “that’s talking to the past. We need to talk to the future: how do we build a robust engineering base in this city?” A laser-like focus on technology is what is needed, where the universities and local authorities take inequality seriously and put funding into apprenticeships for the future, not for the past. Technology and design, Peter Mandelson agreed, are the things that make the most difference to urban life, adding that “digitalisation is going to do for us what electricity did in a previous era.” But will this lead to digital inclusion so that everyone can enjoy the benefits? Achieving that will require first-rate, different forms of digital education such as the proposed new International Screen School in Manchester, to meet the demand for technicians, programmers and designers generated by the digital revolution. 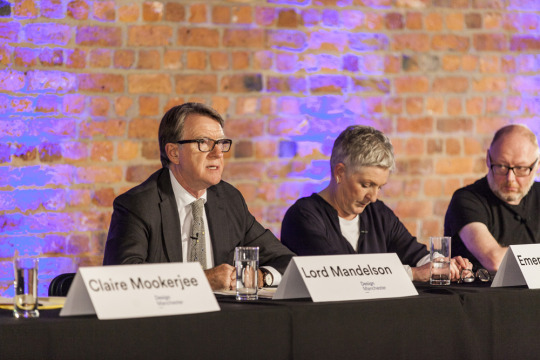 Lord Mandelson (left) is a former EU Trade Commissioner and UK cabinet minister. He is the Chancellor of Manchester Metropolitan University. The old, top-down politics won’t cut it in this new environment, Ian Anderson warned. “A lot of young people are way more developed and advanced in the use of technology than some of the people who are looking to make policy,” he said. Politicians should do a lot more listening to kids who are growing up using social networks, and with design in different fields of technology. 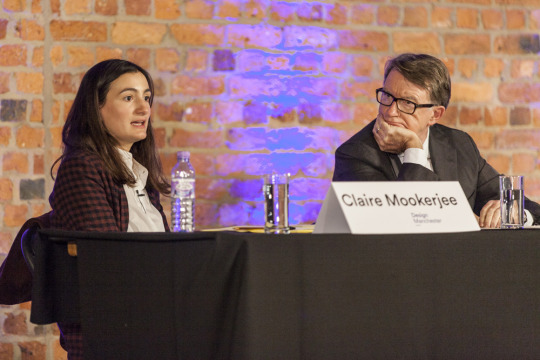 Work and education are changing, Claire Mookerjee pointed out, not least due to rising costs. Lifelong learning and access to courses while working are critical. She was optimistic, however, about job prospects in design. “People who are educated in design are in roles that require empathy and understanding how to tackle questions analytically. These are not going to be automated,” she said. Manchester has great opportunities in advanced materials, an incredble digital creative economy, space and affordability. All this offers the prospect of more exciting business being embedded in the city. Mike Rawlinson (right) pioneered the ‘legible cities’ wayfinding methodology applied in cities all over the world. He is the founder and CEO of design consultancy City ID. 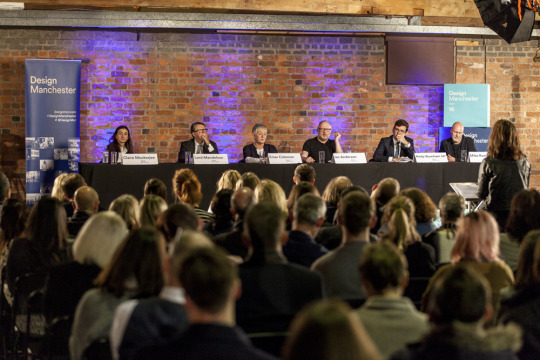 Design Manchester has played an active part in formulating sector advice to the goverment to mitigate the risks and maximise the opportunities of Brexit for the creative industries. 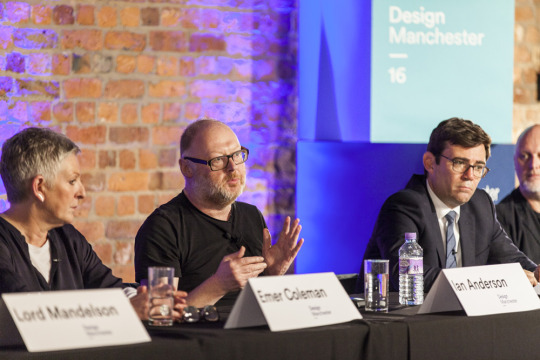 This debate was an opportunity to discuss it with the design community as a whole. As a former EU Trade Commissioner, Peter is all too aware that a carve out for London will not wash. Whatever arrangements the government negotiates will have to work for every sector throughout the country. “There’s almost no part of our economy that isn’t directly or indirectly exposed to our membership of the European Union, through networks, ecosystems and value chains across borders,” he pointed out. “Brexit is essentially about disrupting those links.” It may not be so bad for businesses, which can relocate elsewhere in Europe if single market distribution is important for them. But it won’t be so easy for their employees and the people they leave behind, who won’t have that right to free movement. Emer Coleman (centre) is head of the Co-op’s tech engagement. 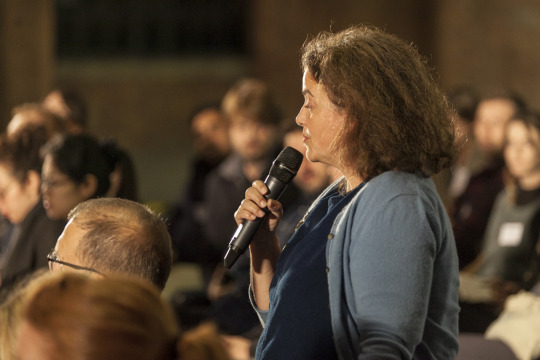 She previously led digital engagement for the UK Government and also founded the London DataStore. There’s “an arms race for talent in technology,” said Emer, so cutting off access to global talent will have a significant impact on startup growth. How can devolution help? “Devolution in England was not conceived as the answer to the referendum result,” Andy said, “but we must now embrace it as such.” National policy has for decades been shaped by the London perspective. Successive governments have ignored the impact of lost industries, absentee landlords and rising European immigration on former industrial communities. There may be a small percentage of people who voted Leave for xenophobic or racist reasons, but “the deeper feeling is: no-one’s looking at us or cares about us – it’s a profound cry for change in how the country is run.” So city devolution must be used to give people more solutions that are focused on them and their needs. Ian Anderson (centre) is founder and creative director of the design group Designers Republic and one of the most influential graphic designers of the last three decades. Fundamentally, Mike said, good cities are “accessible, legible, welcoming places and they should be as open as possible.” That means creating a rich tapestry with building footprints and spaces that work for people, and transport modes that work in partnership. Claire highlighted design interventions that can improve the city, such as more fine-grain open spaces at street level and removing cars from the centre. Councillor David Ellison, the planning chair of Manchester City Council, questioned to what extent planning is helpful in areas other than transport, pointing out that the Northern Quarter, Chinatown and Rusholme, some of the great character districts of the city, weren’t planned from above but grew because of the people who were there. Planning should work with organic development of the city, agreed Peter. The old model of pre-ordained, scorched-earth zonal planning does not work. “Just as we bring new waves of creativity and design to everything else we do, we should also bring it to the way we organicaly allow the city to change, grow and connect together.” But active design intervention is needed too, said Andy. 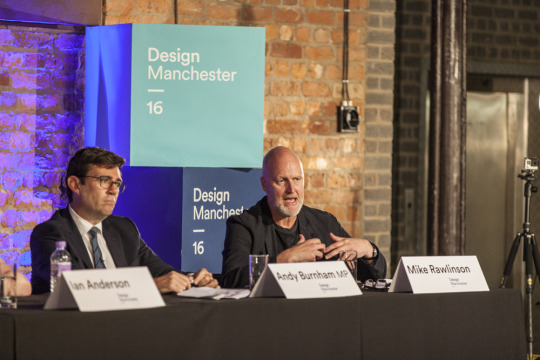 “We need design brains to go into Oldham, Rochdale, Bury and Wigan and look at how they relate to the centre, to connect this city region up a bit more,” he said, describing this as the next phase of Greater Manchester’s work. Manchester has received funding from Innovate UK to develop a large-scale demonstrator to evaluate use of the Internet-of-Things in cities – a two-year project called City Verve, which began in 2016. 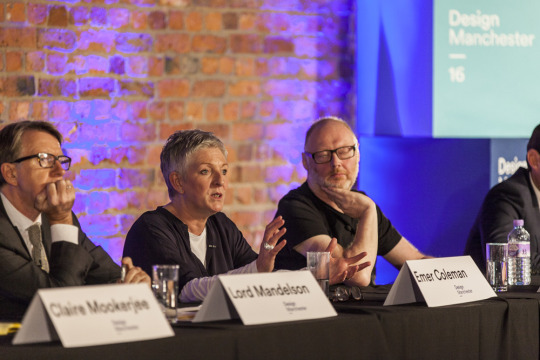 It underlines the strength of the city’s growing creative and digital hub, but how, asked Marketing Manchester’s Destination Director Sara Tomkins, does real-time and Open Data change our cities, and what is the role of design in making best use of new technology? Emer was scathing about the “smart city” narrative we’ve had for nearly a decade, but which, she said “has achieved very little even in its rhetoric,” adding that it was “devised by large systems integrators like the Siemens, Ciscos and IBMs of this world who want to own the infrastructure of a city.” This was, she said, a very technocratic vision of what could be achieved. As director of digital projects for the Mayor of London, Emer established the London Data Store, an initiative to put all of the city’s public service data into the public domain. “We always knew transport was going to be a game-changer,” she said. “So we began a collaborative project with a broad range of technologists and we see now that people can’t conceive of moving around without their cycle hire app or their bus app. The important thing, Ian felt, is that people need a sense of ownership of their own space, of where they are in a city. “There are as many Manchesters as there are people in the city or visiting the city or even with the knowledge of the city,” he said, and the technology should support that. The data revolution has to mean politics done differently, was Andy’s take. “If there was data on air quality every day in real time, people would be shocked because it’s very poor on Oxford Road and in other parts of Greater Manchester,” he said, and this would have an impact by empowering people to ask why, as happened when the data came out on cycling accidents in London. Claire Mookerjee (left) is a designer, urbanist and feminist. She is head of Urban Futures at Future Cities Catapult and Built Environment Expert at Design Council. What about the money though? Mike felt that without fiscal devolution – the ability to redistribute and raise taxes where appropriate, devolution will be a step along the road but won’t go as far as it could. In this area, he said, the mayor must go on challenging the status quo. Andy Burnham (left) is MP for Leigh and Labour candidate for Mayor of Greater Manchester. He is a former health secretary and culture secretary. Andy, as it turned out, had given the matter some considerable thought – and concluded after 15 years in the place, that Parliament isn’t going to fix the problems or bring about the things people want for Greater Manchester, because, as he put it, “it’s fundamentally dysfunctional”. He paid tribute to George Osborne for putting in place a fundamental change that has the potential to rebalance the country and lead to things being done differently.